For many women, a car is significant part of their lives. Even if you’re not into cars, its important for women to equip themselves with basic knowledge about their vehicles. EVEN IF YOUR BROTHER OR DAD SHOWED YOU EVERYTHING! Come out & take a break from the daily grind! 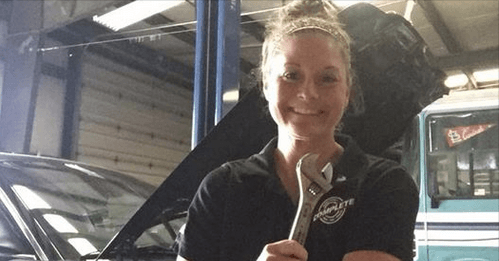 Women Car Care Clinic & Auto Body Clinic is FREE to attend! That’s right FREE! Space is limited to 30 people. Workshops will be held inside the Repair Facility. The workshops are open to all customers & their family & friends. There will be complimentary wine, refreshment & finger foods. All participants will receive a take home goody bag. Contact us TODAY and reserve your spot! The Car Care Clinic & Auto Body Clinic will be held on May 12th, 2018 from 9:00 AM -12:00 PM. Workshops will run about 2 Hours depending on Q & A. – Meet the Owner Kim Barks, Kim has been in the industry since 2006. Over 12yrs in the Car & Auto Body Industry. – Meet Kim’s Dad, Bob Barks, Bob has been in the industry since 1975. Over 43yrs in the Car & Auto Body Industry. 10:15AM- Grab a snack & drink, find a seat! The Workshop Speakers will be Kim & Her Dad along with her (2) Managers. First 10 People to Register will receive a SPECIAL PRIZE! (636) 724-2232 or email Kim at kimbarks@completestl.com, please provide your name and email with how many will be attending. Kim will send you confirmation. For a map to Complete Car & RV Repair visit our directions page on our website at WWW.COMPLETESTL.COM, scroll to the bottom it will take you to google maps.